LOS ANGELES – August 8, 2017– Executives with Carroll Shelby International and DenBeste Motorsports have announced that production of the highly anticipated 427 Shelby Cobra Competition racecar is going full throttle with three cars finished and four more in process. The authentic turnkey racecars will represent the final cars available from the original Competition big block Cobra series that started in 1965. Identical to the handful of original roadsters manufactured in the 1960s, these racecars are built to order in California, as Carroll Shelby did 50 years ago. The program was announced by the Carroll Hall Shelby Trust and DenBeste Motorsports in 2014. Since then, DenBeste Motorsports has refined the production process and taken orders for customers worldwide. The Shelby 427 Cobra Competition program has a well-documented history. 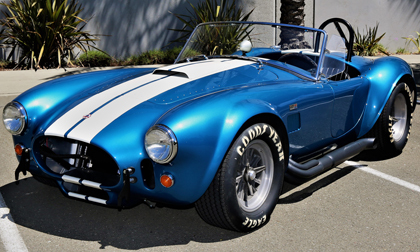 In 1964, Shelby American and Ford developed a new evolution of the existing small block Cobra. It featured an entirely new suspension and a stronger frame to accommodate more power from a 427 NASCAR based big block engine. The Cobras were so different that they were assigned a new VIN series, beginning with CSX3000. In 2014, the Carroll Hall Shelby Trust and DenBeste Motorsports agreed to finish the remainder of the series as pure racecars built to the FIA GT class specs. DenBeste Motorsports is a prominent Shelby Cobra dealer; Bill DenBeste is also co-owner of a NASCAR race team and the Carroll Shelby Engine Company. Each competition chassis Cobra features a hand rolled aluminum body prepared by Cobra restorer Drew Serb and an original style interior. The engine is a period correct cast-iron Ford side oiler 427 with medium riser cylinder heads connected to a correct 4-speed gearbox with an authentic swept forward shifter. The Shelby features Raydyot mirrors, Girling brakes and other original parts sourced with the guidance of Shelby Cobra expert Mike McCluskey. The authentic Shelby Cobras have an official CSX 3000 series VIN and Shelby MSO. Each Cobra is submitted to the Shelby American Automobile Club Registry, as well as the official Shelby American Registry administered by Carroll Shelby International. Those interested in one of the remaining Shelby 427 Competition Cobras can contact DenBeste Motorsports at (800) 838-1477 or via email at bdenbeste@denbeste.com. Additional information is available at http://www.denbestemotorsports.com/build-cobra/shelby-427-competition-cobra. Founded by Bill DenBeste, DenBeste Motorsports is the preeminent source for authentic continuation Shelby Cobra roadsters, as well as CSX9000 Daytona Coupes and GT40’s. DenBeste Motorsports currently has the largest inventory of continuation heritage Shelby rolling chassis in the world. A prominent car collector, Mr. DenBeste was fortunate enough to become good friends with Carroll Shelby. Bill’s passion for cars and their friendship led him to open DenBeste Motorsports in 2008. Since then, DenBeste Motorsports had grown to one of the most prolific Shelby dealers. DenBeste also partnered in NASCAR’s Nationwide Series, fielding the Biagi-DenBeste Racing #98 car. In addition, Mr. DenBeste purchased the Carroll Shelby Engine Company in 2010, moving it to Northern California. Additional information is available at www.denbestemotorsports.com.